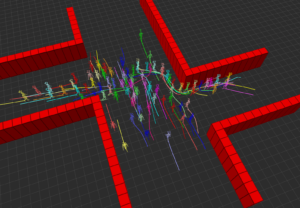 We present a mobile robot motion planning approach under kinodynamic constraints that exploits learned perception priors in the form of continuous Gaussian mixture fields. Our Gaussian mixture fields are statistical multi-modal motion models of discrete objects or continuous media in the environment that encode e.g. the dynamics of air or pedestrian flows. We approach this task using a recently proposed circular linear flow field map based on semi-wrapped GMMs whose mixture components guide sampling and rewiring in an RRT* algorithm using a steer function for non-holonomic mobile robots. In our experiments with three alternative baselines, we show that this combination allows the planner to very efficiently generate high-quality solutions in terms of path smoothness, path length as well as natural yet minimum control effort motions through multi-modal representations of Gaussian mixture fields.